Thanks so much to everyone for their lovely comments on the new pattern, the Stripy Stashbuster Vest, I released yesterday. 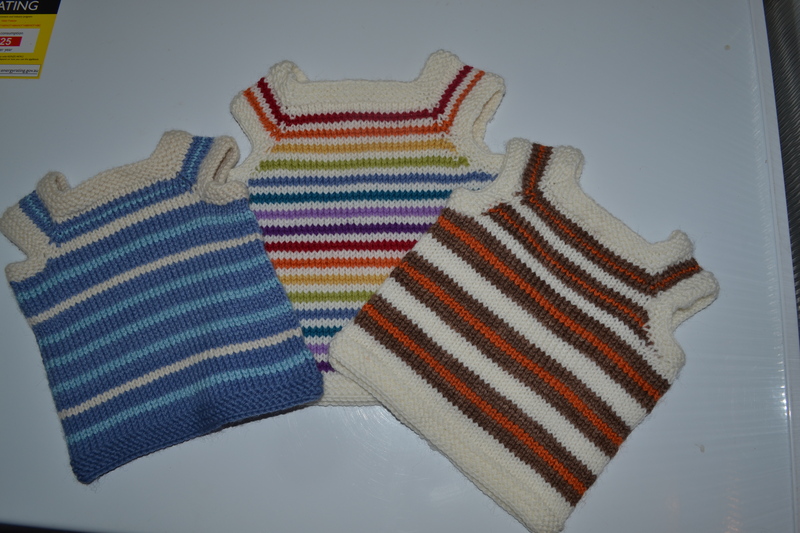 I hope to see some cute stripey vests in lots of different colours springing up on your Ravelry pages in the coming weeks! Winter’s coming! Must be time for new hats. 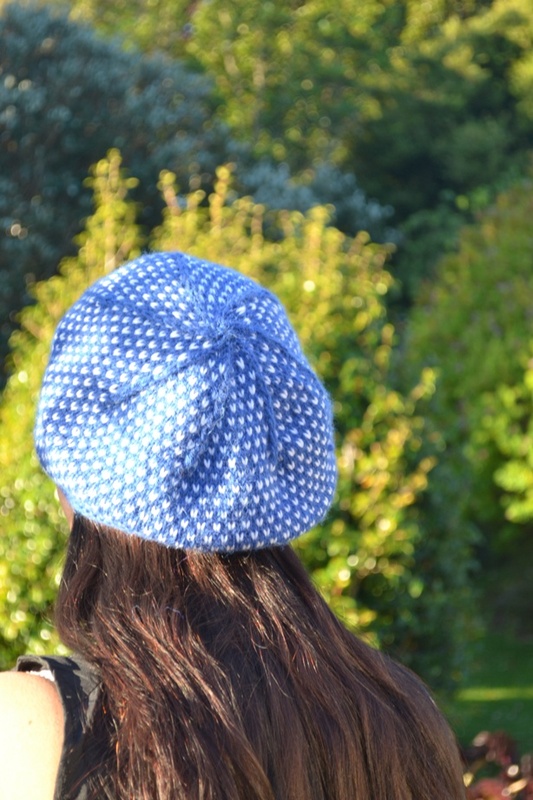 Well, it’s Autumn anyway, and you know that I’m a total hat addict, any excuse for a hat knit… And while knitting a hat is fun, knitting two is better. 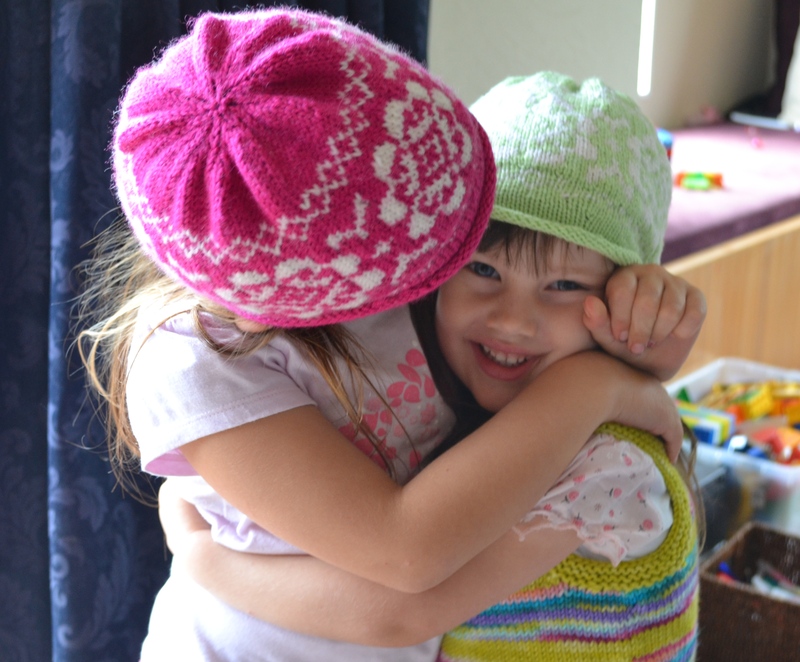 Hard to believe, but these two cute Colour Me Pretty hats are my first time knitting any of Elena Nodel’s gorgeous patterns. Surprising mostly because she designs gorgeous patterns, mostly for little girls. And I do love to knit for my girls! I have quite a few on my want list for this winter, and I have serious difficulties deciding which ones I love the best. I think Paprika might win out for the next cast on for Miss 5. 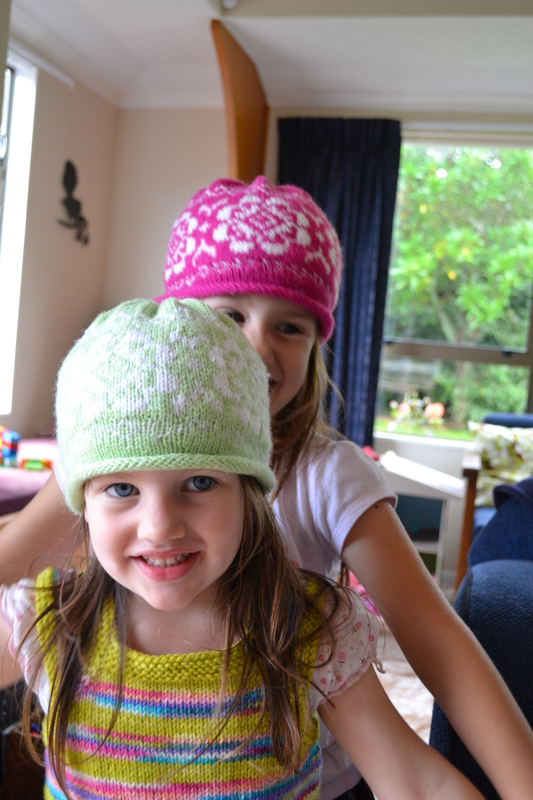 I had lots of fun knitting these hats. 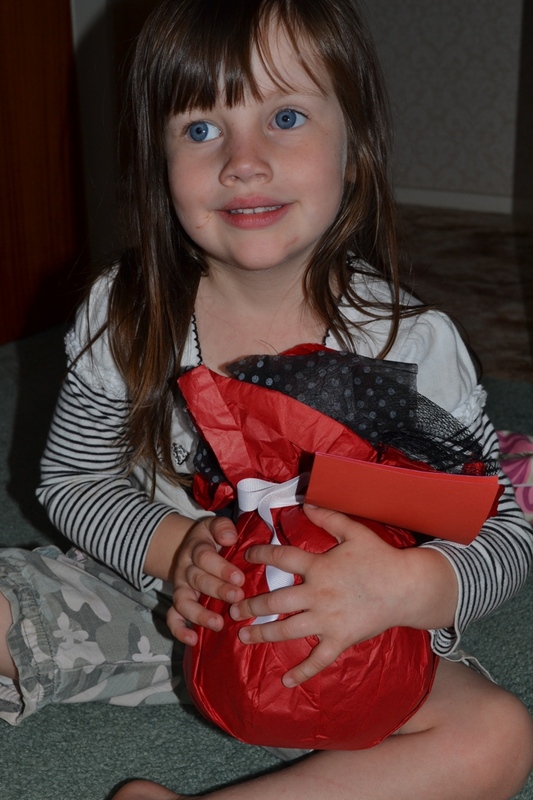 First up was one for Miss 5. I made hers from some bright pink Spotlight Moda Vera DK weight yarn, with white contrast. 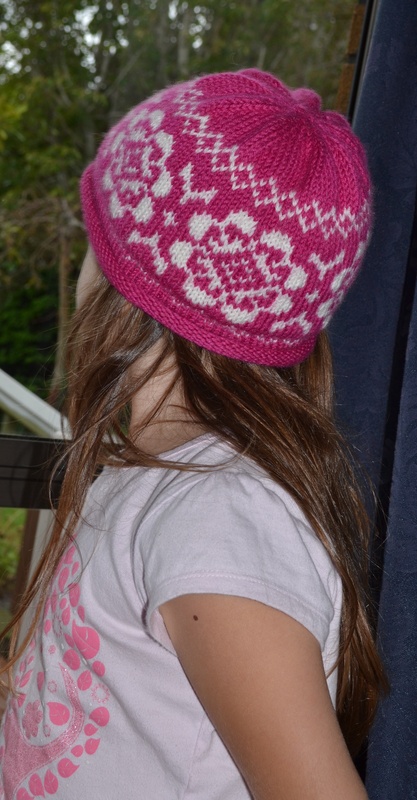 The pattern suggests that you can use multiple colours for the different colourwork parts in the hat, with even a rainbow of colours shown in the chart. But having looked at the projects on Ravelry, I decided a simple contrast would be effective. Also I wanted to knit this from stash. I managed to get this out of one ball of yarn – just! I had nothing at all to spare when I cast off. I followed all of the instructions but I got the first bit of colourwork a little bit tight. I’m pleased to say that the rest is okay, and the second hat was fine. 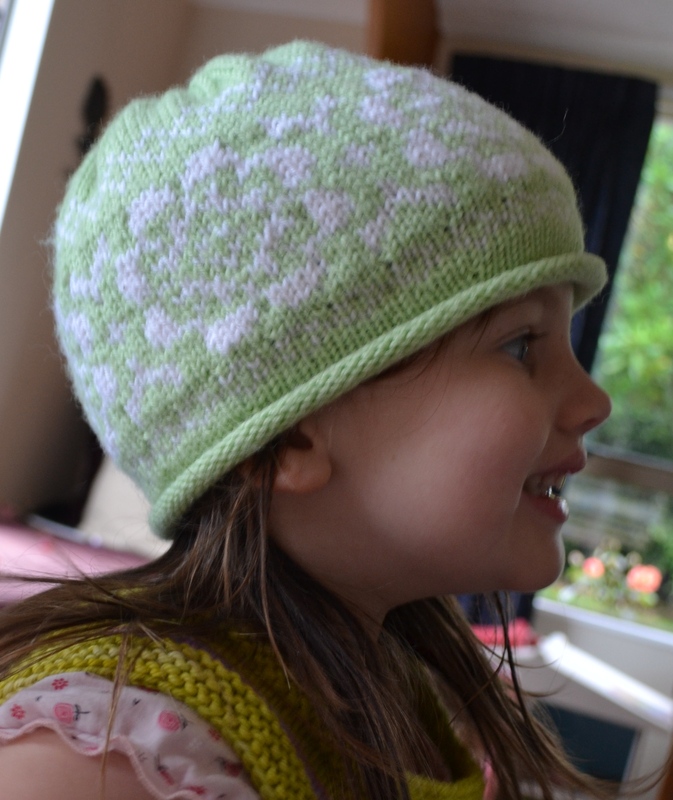 Of course no sooner had I knit this than a second hat was required. In green. Some children are SO predicable! But with no cute greens in stash, I needed a quick trip to the yarn shop… I grabbed some lovely Naturally Loyal DK in a lovely light green, which Miss 3 loves. She knew exactly what it was for when I unwrapped it. And insisted I cast on right away. When I was putting together my package for our recent magic yarn ball swap, I got assigned a swap partner who is adores The Hunger Games. I figured that I could put together a parcel that was Hunger Games related. 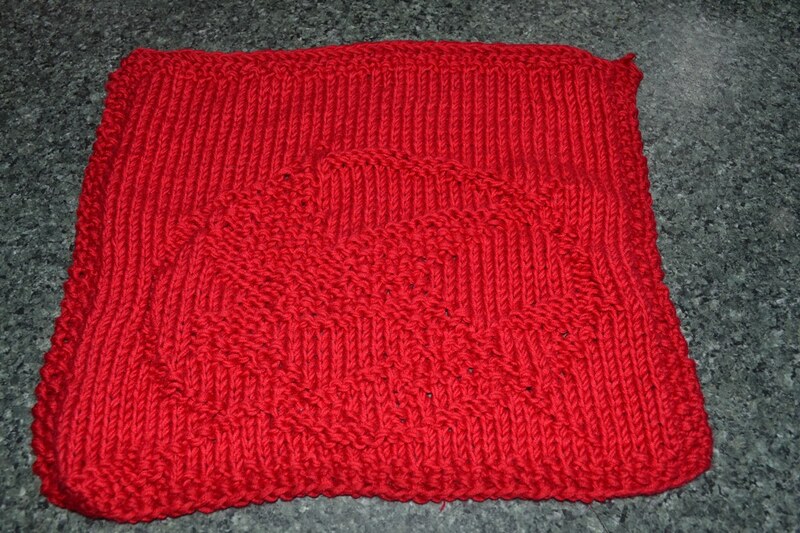 A quick Ravelry search came up with some Mockingjay charts, which seemed like the perfect idea for a dishcloth. The chart that I used was intended for colourwork, but instead I used it to make a reverse stocking stitch pattern on the dishcloth, as I didn’t think that the reverse side of colourwork would be that practical for in the kitchen. I worked it double stranded using Dk weight bamboo yarn, Patons Serenity, which was a stashed yarn, leftovers from a project more than two years ago, and I used 5.5mm needles. I could have centred the design slightly better – but when I had finished the chart the cloth was very rectangular, and so I kept knitting until it was more square. I matched it with some ‘nightlock berries’ stitch markers, a little felt pouch, and some gorgeous China Glaze Hunger Games nailpolish. It didn’t feel like a lot of goodies for a magic yarn ball, but I was fresh out of themed ideas, time, and budget. But, my recipient ended up winding the yarn rather than knitting it out, so I don’t feel quite so badly about it now! This was a fun little project, and I have always enjoyed the gratification of quick project, and this was no different – that said, it did take a couple of nights of chart following, but I think it was worth the result. 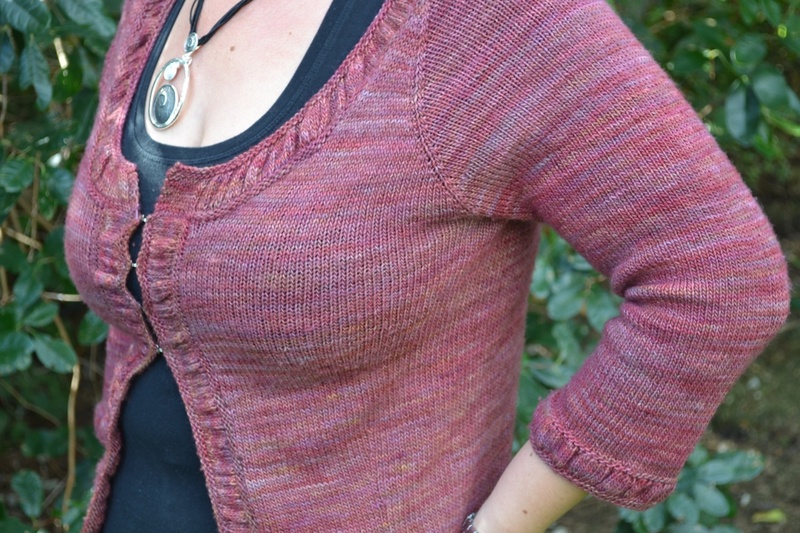 So, without (any) further ado, may I introduce to you my Making Waves cardigan. This is a great transitional cardigan – knit in 4 ply it would be ideal for spring and autumn, and hopefully winter too in my new classroom which has a heater that is far more effective than my former classroom’s one! I used gorgeous Madelinetosh yarn – this is the Tosh Merino Light, in the stunning Amber Trinket colourway. I have had my eye on this colour since the lovely Lina at Photo.Knit.Dog knit a cardigan in it way back in Feb 2011. I was lucky enough to score three skeins on special mid-way through last year at Hidden Purls, waiting for me to decide on what to knit. Late last year they had another sale and I had to stop myself buying more yarn when I hadn’t knit what I had already bought. It was just the push I needed to choose a pattern and cast on. 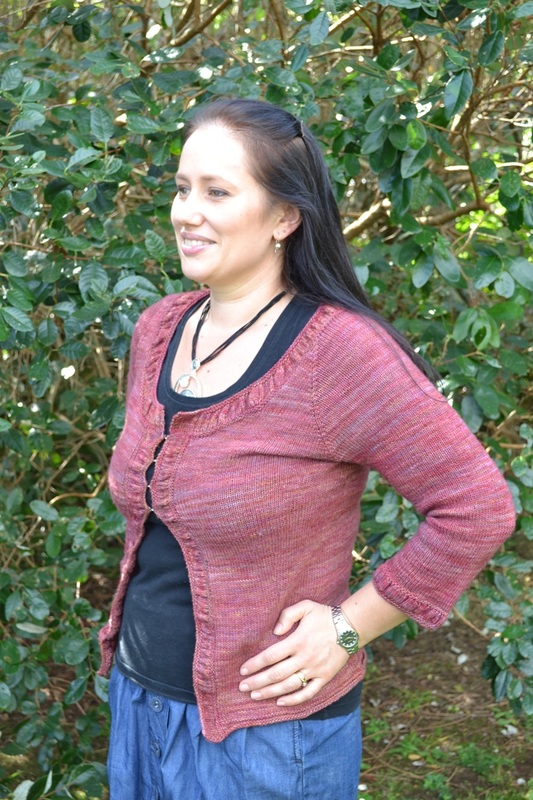 I chose the Making Waves Cardigan as it had caught my eye on several occasions. I like the simplicity of this top-down seamless raglan. the fit across the back and shoulders is just the lovely fitting silhouette that suits the 4 ply cardigan, and the understated ruffles suited the tones of the yarn which is neither a true semi-solid nor variegated, but a complex mixture of amber tones. As with all the MadTosh yarn I’ve used so far, there were definite differences in the skeins. I alternated though the second and third skeins which seemed to contain a mixture of the tones from the first skein. The knitting could not have been simpler. I had not a single issue with the pattern and knit it completely as written. What a pleasure to find such an accessible, well written pattern from an independent designer. Of course, that does make me want to try another of her patterns. 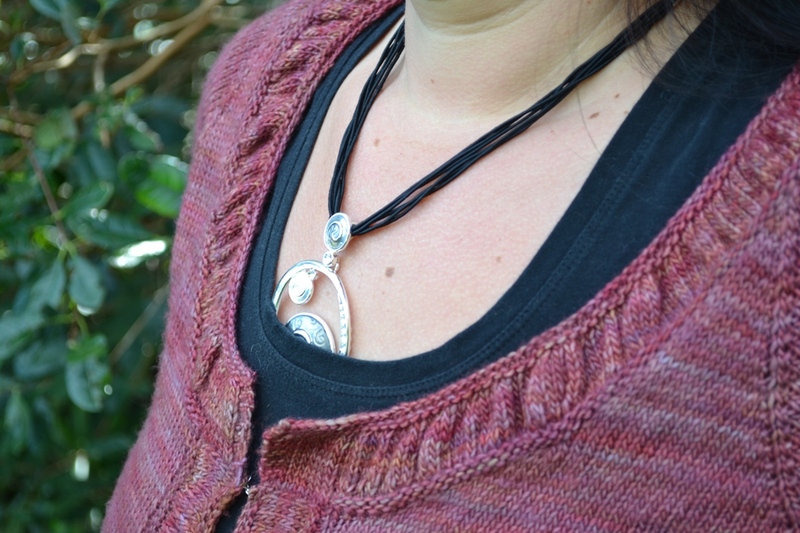 I’ve got my eye on the Elphaba Pullover, another gorgeous 4 ply knit. 4 ply is ideal for the mild winters we have in the North West, so I just cannot stop myself from looking at (and buying, and making) knits/yarn in this weight. This is just as lovely to wear as you would imagine. The yarn is a single ply yarn, so very very soft. I had worn it a number of times before the photos were taken, and as you can see it is still in very good condition. There is a small amount of pilling, not anywhere as much as you might expect. Instead it is just delicious cosy. I am so pleased with this, I’m sure that it will get lots of use in the coming months, and hopefully the coming years. Over the past few months, I’ve been working on a number of patterns. Tonight I have released two of them for sale, and they are cousins of the popular pattern, Benji. I made both samples from a yarn that was new to me – the lovely Rare Essentials yarn. An 80% Alpaca, 20% merino yarn in DK weight, I used around 60g for each hat, and used various contrasts: the darker hat uses a white Patons DK Merino, and the light blue hat uses Madelinetosh Tosh DK in Silver Fox. You can use either DK or worsted weight yarn for the beret. The DK drapes beautifully, and I think this will be a very enjoyable hat to wear in the late autumn when the chill starts to set in. 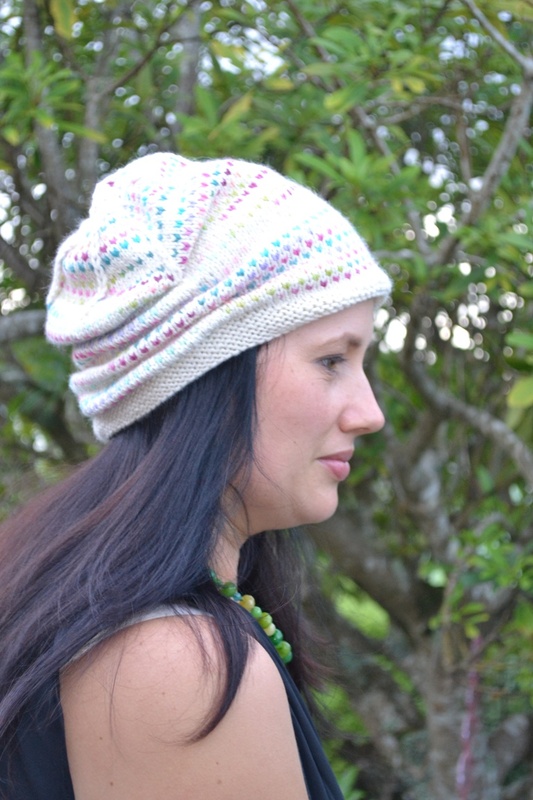 The Benji Slouch Hat is the other pattern released tonight. 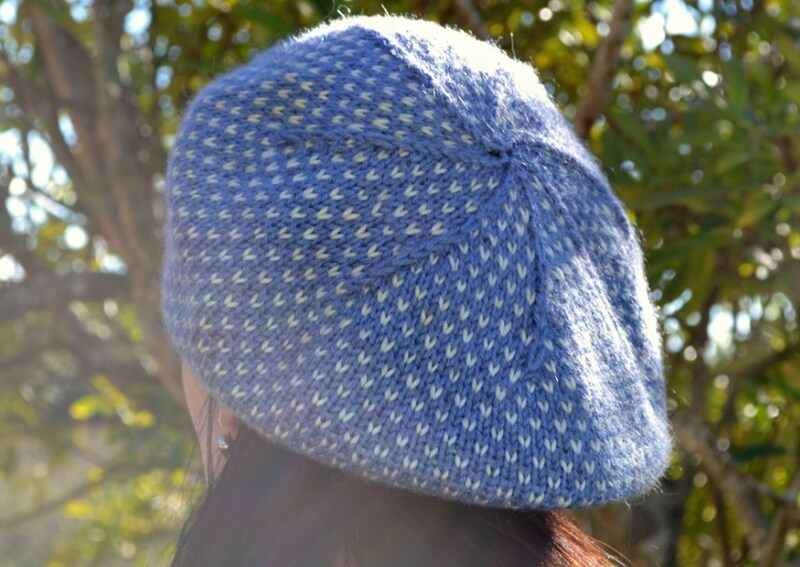 This is a fun design that incorporates pleats that give the hat its slouchy structure. This adds a little more challenge to the pattern, but it is very achieveable all the same. This sample is knit up in 100Purewool 3 ply worsted, undyed, with some lovely Ladybug Loops yarn variegated yarn as the contrast yarn. This was a cute, fun contrast and is bright and cheerful. Each of these pattern are available on Ravelry, and if you would like, you are also able to purchase them together with the Benji beanie pattern as an ebook. AND if you already own the Benji pattern, when you purchase either of these patterns you will automatically receive a 50% discount at the checkout. Gorgeous 10ply hand-dyed yarn, in the most delicious shades of red. I love me a good semi-solid, and I’m such a sucker for red. Now, the general idea with a magic yarn ball is that wrapped inside are treasures, and that you knit out each one. So, I had to cast on! I chose to cast on a hat pattern I had admired but not had a chance to knit. 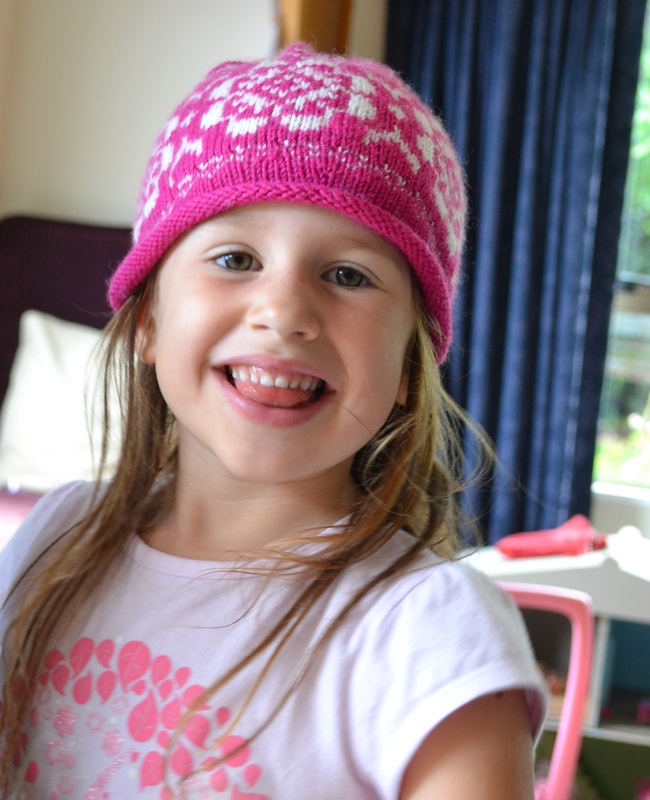 It is the lovely Brambles beret, a free pattern from Knitty.com. I have used some modifications that I spied in other FOs on Ravelry, so you’ll have to watch this space for the finished hat when it’s done. I’ve got a bit of other knitting on at the moment, so I’m making sure I do some on this every evening – to try to get the parcels out from inside of course! 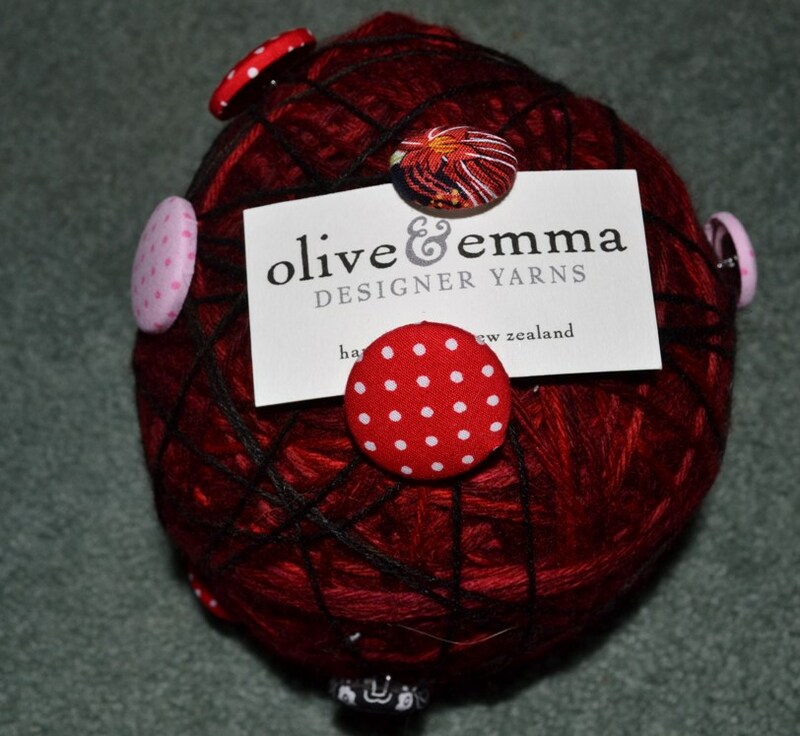 The yarn was sent to me by the lovely Emma, from the brand new yarn dyers Olive and Emma. Emma has just opened up shop, although she has been dyeing yarn for several years for herself, swaps and the odd custom job. I’ve always admired her work, so I’m delighted to have the chance to try is out for myself. It is super pretty so far! You should check out her shop stocking – Wednesdays at 8pm NZ time – so, she’ll be loading stock up this evening. She’s posted some gorgeous pictures of her work there, along with links of some knit up – I’m sure you’ll love her yarn too if you get your hands on some. I thought it was well past time I popped on to wish you all a very happy New Year. I have been taking my needles and knitting with me though, and I’m making good progress on my first project for the year, which is a lovely cardigan, Making Waves by Mary Annarella. I cast on in lovely MadelineTosh Tosh Merino Light, which is a 4 ply single, and is knitting up beautifully. The colourway is Amber Trinket, which is a stunning combination of colours – I adore these photos of Lina’s cardigan which made me fall in love with this colourway. In typical Tosh fashion, no two skeins seem to be the same, so I’ve had to alternate skeins through the body and I’m hoping the sleeve skein has enough of the various colours in to avoid having to do so in the arms too though. Looking good so far – about four inches down the first arm. Apologies for the links rather than photos – guess who forgot to bring their camera? ?